Colloidal nanocrystals have generated a growing interest for the last 4 years, thanks to their use as light source for the last generation of LCD display. Colloidal nanocrystal are as promising for optoelectronic, in particular for light detection in applications such as solar celsl and infrared imaging. Nevertheless synthetizing colloidal material absorbing in the infrared range remains a chemical challenge. For the last 10 years a race to synthetize redder and redder materials has been launched. Members of the physical chemistry team from INSP have obtained a record by synthetizing nanocrystals with optical features in the THz range. This wavelength range was so far unreachable for colloidal nanoparticles. This invention has led to a joint patent application between CNRS and the start-up company Nexdot. To achieve infrared absorption from semiconductors, two strategies might be explored : either using interband transitions in a narrow band gap semiconductor (InSb) or in a semimetal (HgTe), or using intraband transitions in doped semiconductors. For long this second strategy was difficult to achieve for colloidal materials because of the difficulty to dope them. Recent progress have been reported in particular regarding the growth of self-doped materials. Such materials are doped even without introducing extrinsic dopant. In this case the doping result from the electrochemical reduction of the nanoparticle by the environment. The INSP team has developed a hybrid strategy which deals with the synthesis of doped semimetal, made of HgSe and HgTe. Moreover to achieve extremely narrow energy transition, the team had to reduce the quantum confinement. The new synthetic procedure, developed jointly with an ESPCI team, allows to tune the nanoparticle size from a few nm (strongly confined regime) to several hundreds of nm (bulk-like regime). As a result, the whole infrared spectrum for 1µm to 100µm can be spanned. In particular this is the first time that a THz frequency is reported for colloidal semiconductor. 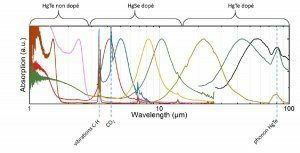 Infrared spectrum of mercury chalcogenides nanoparticle with and without doping with optical features from 1µm to 100µm. The next steps will involve the transport and phototransport investigation of this material as well as tuning finely the doping magnitude. • Terahertz HgTe nanocrystals : beyond confinement, N. Goubet, A. Jagtap, C. Livache, B. Martinez, H. Portales, X. Zhen Xu, R.P.S.M. Lobo, B. Dubertret, E. Lhuillier, J. Am. Chem. Soc. 140, 5053 (2018). 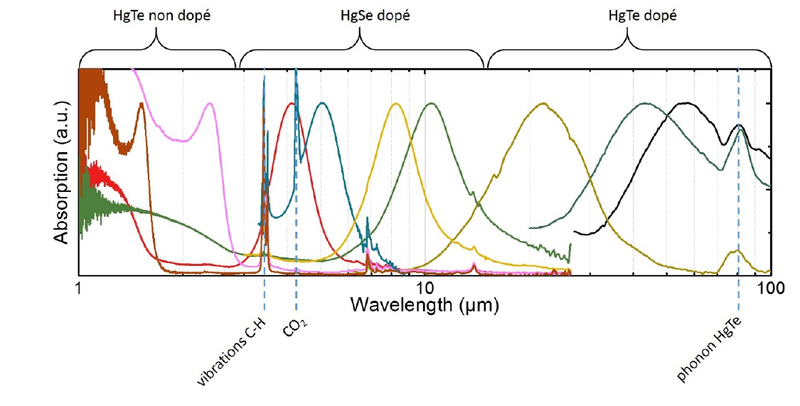 •HgSe self-doped nanocrystals as a platform to investigate the effects of vanishing confinement, B. Martinez, C. Livache, L. Donald Notemgnou Mouafo, N. Goubet, S. Keuleyan, H. Cruguel, S. Ithurria, H. Aubin, A. Ouerghi, B. Doudin, E. Lacaze, Benoit Dubertret, M. G. Silly, R. P.S.M. Lobo, J. F. Dayen, E. Lhuillier, ACS Appl. Mater. Interfaces 9, 36173 (2017) •Infrared photo-detection based on colloidal quantum-dot films with high mobility and optical absorption up to the THz, E. Lhuillier, M. Scarafagio, P. Hease, B. Nadal, H. Aubin, X. Z. Xu, N. Lequeux, G. Patriache, S. Ithurria, B. Dubertret, Nano Lett 16, 1282 (2016) •Surface Control of Doping in self-doped Nanocrystals, A. Robin, C. Livache, S. Ithurria, E. Lacaze, B. Dubertret, E. Lhuillier, ACS Appl. Mat. Interface 8, 27122−27128 (2016).